From left, James Brink, MD, chief of Radiology; Hartley Neel, MD; Ginny Neel; and Dr. Brit Nicholson, MD, senior vice president for Development, with a painting Dr. Neel donated to Mass General. Hartley Neel, MD, the son of pioneering 20th century artist Alice Neel, is donating one of his mother’s paintings to the Mass General Division of Radiology. 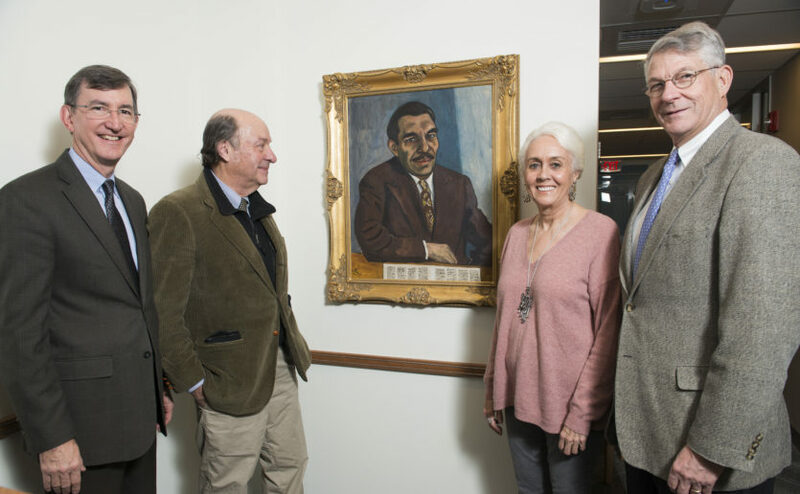 Hartley Neel, MD, the son of pioneering 20th century artist Alice Neel, is donating one of his mother’s paintings to the Massachusetts General Hospital Division of Radiology where he received his early training as a radiologist, and where his mother received medical care. Alice Neel’s artwork was inspired by the diversity of her neighborhood of Harlem, in New York City, where she painted from the 1930s to the 1970s. She called herself “a collector of souls,” focusing on portraits. Recent retrospective exhibitions in New York, London, Venice and Helsinki have showcased her ability to capture the unique personalities of her subjects. Her son, Dr. Neel, and his wife, Ginny, of Vermont chose to donate an oil portrait of chemist Morris Schiller, who Alice Neel painted in 1952. “It captures the combination of intelligence and empathy that makes the ideal physician,” Dr. Neel says. That combination inspired the Neels’ gift to Mass General, where Dr. Neel trained in radiology and where his mother, late in life, received medical care. “The level of technical expertise at Mass General is great, but the clinician-scientists here are also sympathetic and compassionate,” Dr. Neel says. He went on to launch the first radiology clinic with advanced scanners in a community health center in Vermont. Dr. Neel credits the expertise he gained during his training at Mass General with giving him the confidence to encourage the center to invest in CT scans and provide patients with better diagnostic tools to improve treatment. James Brink, MD, chief of the Mass General Division of Radiology, says he is pleased with the impact the donation may have on research in radiology. “I am grateful to the Neels for entrusting us with this artwork and honored to be able to look at the portrait every day,” Dr. Brink says. “I am grateful to the Neels for entrusting us with this artwork and honored to be able to look at the portrait every day,” Dr. Brink says. “And I look forward to the new research breakthroughs this gift may make possible.” Eventually, the painting may be sold to help support radiology research. Private philanthropy allows clinicians to explore research projects that fall outside the parameters of traditional funding areas. Mass General has played a leadership role in the development of advanced imaging techniques for breast and other cancers while reducing patients’ exposure to radiation. When Ginny Neel’s mother-in-law was treated at Mass General in her 70s, Ginny says Alice was impressed by the quality of the care she received, as well as the respect with which she was treated by every member of the staff. The Neels hope that while the painting is on view in the Division of Radiology, people will admire and be inspired by it. One day, its sale may help fund the research that will improve patient care. To learn more about how you can support the Division of Radiology at Mass General, contact us.